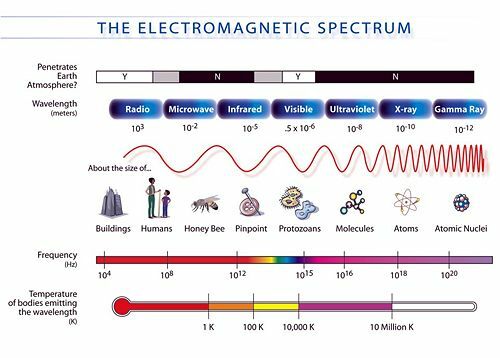 The electromagnetic (EM) spectrum is the range of all possible electromagnetic radiation. 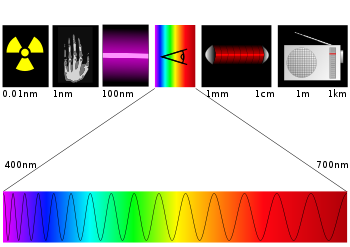 The "electromagnetic spectrum" (or just spectrum) of an object is the characteristic distribution of electromagnetic radiation from that object. 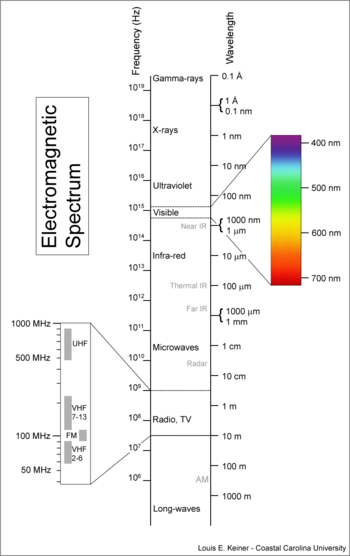 The electromagnetic spectrum, shown in the chart, extends from just below the frequencies used for modern radio (at the long-wavelength end) to gamma radiation (at the short-wavelength end), covering wavelengths from thousands of kilometers down to fractions of the size of an atom. In our universe, the short wavelength limit is likely to be the Planck length, and the long wavelength limit is the size of the universe itself, though in principle the spectrum is infinite. The most familiar part of the electromagnetic spectrum is the visible region, which spans the colors of the rainbow (wavelength range of 400-700 nanometers (nm)). We are able to see things because our eyes are sensitive to this region of the spectrum. A variety of applications have been found for the different parts of the spectrum. For instance, radio waves are used for the transmission of data for television, mobile phones, and wireless networking. X-rays and gamma rays are used in medicine. The spectrum covers EM energy having wavelengths from thousands of kilometers down to fractions of the size of an atom. c is the speed of light, 299,792,458 m/s (exact). h is Planck's constant, . So, high-frequency electromagnetic waves have a short wavelength and high energy; low-frequency waves have a long wavelength and low energy. When light waves (and other electromagnetic waves) enter a medium, their wavelength is reduced. 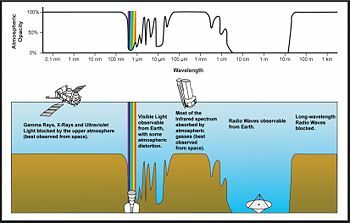 Wavelengths of electromagnetic radiation, no matter what medium they are traveling through, are usually quoted in terms of the vacuum wavelength, although this is not always explicitly stated. The behavior of EM radiation depends on its wavelength. Higher frequencies have shorter wavelengths, and lower frequencies have longer wavelengths. When EM radiation interacts with single atoms and molecules, its behavior depends on the amount of energy per quantum it carries. Electromagnetic radiation can be divided into octaves—as sound waves are—winding up with eighty-one octaves. Spectroscopy can detect a much wider region of the EM spectrum than the visible range of 400 nm to 700 nm. A common laboratory spectroscope can detect wavelengths from two nm to 2500 nm. Detailed information about the physical properties of objects, gases, or even stars can be obtained from this type of device. It is widely used in astrophysics. For example, many hydrogen atoms emit radio waves which have a wavelength of 21.12 cm. Although the classification scheme is generally accurate, there is often some overlap between neighboring types of electromagnetic energy. For example, SLF radio waves at 60 Hz may be received and studied by astronomers, or may be ducted along wires as electric power. Also, some low-energy gamma rays actually have longer wavelengths than some high-energy X-rays. The reason for this is that the term "gamma ray" is used for photons generated from nuclear decay or other nuclear and subnuclear processes, whereas X-rays are generated by electronic transitions involving highly energetic inner electrons. Thus the distinction between gamma rays and X-rays is related to the radiation source rather than the radiation wavelength. Generally, nuclear transitions are much more energetic than electronic transitions, so gamma-rays are usually more energetic than X-rays. However, there are a few low-energy nuclear transitions (such as the 14.4-keV nuclear transition of Fe-57) that produce gamma rays that are less energetic than some of the higher energy X-rays. Radio waves generally are utilized by antennas of appropriate size (according to the principle of resonance), with wavelengths ranging from hundreds of meters to about one millimeter. They are used for transmission of data, via modulation. Television, mobile phones, wireless networking and amateur radio all use radio waves. Radio waves can be made to carry information by varying a combination of the amplitude, frequency and phase of the wave within a frequency band. When EM radiation impinges upon a conductor, it couples to the conductor, travels along it, and induces an electric current on the surface of that conductor by exciting the electrons of the conducting material. This effect (the skin effect) is used in antennas. EM radiation may also cause certain molecules to absorb energy and thus to heat up; this is exploited in microwave ovens. Use of the radio frequency spectrum is regulated by governments. This is called frequency allocation. The super high frequency (SHF) and extremely high frequency (EHF) of Microwaves come next up the frequency scale. Microwaves are waves which are typically short enough to employ tubular metal waveguides of reasonable diameter. Microwave energy is produced with klystron and magnetron tubes, and with solid state diodes such as Gunn and IMPATT devices. Microwaves are absorbed by molecules that have a dipole moment in liquids. In a microwave oven, this effect is used to heat food. Low-intensity microwave radiation is used in Wi-Fi. The average microwave oven in active condition is, in close range, powerful enough to cause interference with poorly shielded electromagnetic fields such as those found in mobile medical devices and cheap consumer electronics. Terahertz radiation is a region of the spectrum between far infrared and microwaves. Until recently, the range was rarely studied and few sources existed for microwave energy at the high end of the band (sub-millimeter waves or so-called terahertz waves), but applications such as imaging and communications are now appearing. Scientists are also looking to apply Terahertz technology in the armed forces, where high frequency waves might be directed at enemy troops to incapacitate their electronic equipment. Far-infrared, from 300 GHz (one mm) to 30 THz (ten μm). The lower part of this range may also be called microwaves. This radiation is typically absorbed by so-called rotational modes in gas-phase molecules, by molecular motions in liquids, and by phonons in solids. The water in the Earth's atmosphere absorbs so strongly in this range that it renders the atmosphere effectively opaque. However, there are certain wavelength ranges ("windows") within the opaque range which allow partial transmission, and can be used for astronomy. The wavelength range from approximately 200 μm up to a few mm is often referred to as "sub-millimeter" in astronomy, reserving far infrared for wavelengths below 200 μm. Mid-infrared, from 30 to 120 THz (10 to 2.5 μm). Hot objects (black-body radiators) can radiate strongly in this range. It is absorbed by molecular vibrations, that is, when the different atoms in a molecule vibrate around their equilibrium positions. This range is sometimes called the fingerprint region since the mid-infrared absorption spectrum of a compound is very specific for that compound. Near-infrared, from 120 to 400 THz (2,500 to 750 nm). Physical processes that are relevant for this range are similar to those for visible light. Above infrared in frequency comes visible light. This is the range in which the sun and stars similar to it emit most of their radiation. It is probably not a coincidence that the human eye is sensitive to the wavelengths that the sun emits most strongly. Visible light (and near-infrared light) is typically absorbed and emitted by electrons in molecules and atoms that move from one energy level to another. The light we see with our eyes is really a very small portion of the electromagnetic spectrum. A rainbow shows the optical (visible) part of the electromagnetic spectrum; infrared (if you could see it) would be located just beyond the red side of the rainbow with ultraviolet appearing just beyond the violet end. Next in frequency comes ultraviolet (UV). This is radiation whose wavelength is shorter than the violet end of the visible spectrum. Being very energetic, UV can break chemical bonds, making molecules unusually reactive or ionizing them, in general changing their mutual behavior. Sunburn, for example, is caused by the disruptive effects of UV radiation on skin cells, which can even cause skin cancer, if the radiation damages the complex DNA molecules in the cells (UV radiation is a proven mutagen). The Sun emits a large amount of UV radiation, which could quickly turn Earth into a barren desert, but most of it is absorbed by the atmosphere's ozone layer before reaching the surface. After UV come X-rays. Hard X-rays have shorter wavelengths than soft X-rays. X-rays are used for seeing through some things (such as soft tissue) and not others (such as bone), as well as for high-energy physics and astronomy. Neutron stars and accretion disks around black holes emit X-rays, which enable us to study them. X-rays can penetrate through most substances, and this property makes them useful in medicine and industry. X-rays are given off by stars, and strongly by some types of nebulae. An X-ray machine works by firing a beam of electrons at a "target." If we fire the electrons with enough energy, X-rays will be produced. After hard X-rays come gamma rays. These are the most energetic photons, having no lower limit to their wavelength. They are useful to astronomers in the study of high-energy objects or regions and find a use with physicists thanks to their penetrative ability and their production from radioisotopes. The wavelength of gamma rays can be measured with high accuracy by means of Compton scattering. Note that there are no defined boundaries between the types of electromagnetic radiation. Some wavelengths have the properties of two regions of the spectrum. ↑ What is Light? – UC Davis lecture slides. Retrieved March 16, 2008. ↑ Glen Elert, 2007, The Electromagnetic Spectrum The Physics Hypertextbook. Retrieved March 16, 2008. ↑ Tomislav Stimac, Definition of frequency bands Retrieved March 16, 2008. ↑ Isaac Asimov, Isaac Asimov's Book of Facts (Hastingshouse/Daytrips Publ., 1992, ISBN 0448157764), 389. Light and Matter. Chapter 11. Electromagnetism A chapter from an online textbook by Benjamin Crowell. Radio and Light Waves in a Vacuum Conversion of frequency to wavelength and back. U.S. 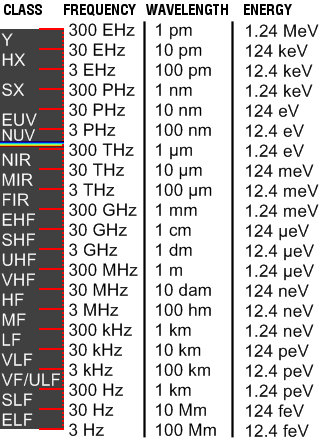 Frequency Allocation Chart Covering the range three kHz to 300 GHz (from Department of Commerce). UK frequency allocation table from Ofcom, which inherited the Radiocommunications Agency's duties,. This page was last modified on 18 September 2017, at 21:34.